Six weeks ago, BOM hit up Shadowland. 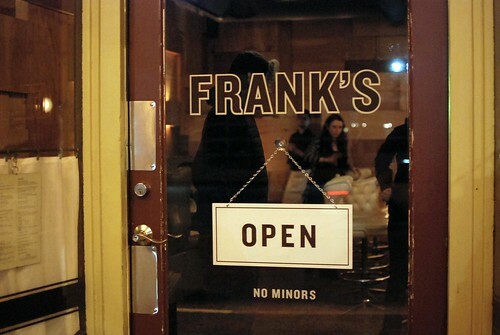 For November/December, we had a combined-month outing to Frank’s Oyster House & Champagne Parlor in Ravenna. -I knew when I saw the goat cheese deviled eggs on the menu online that Mr. T would want them. Good but not mindblowingly great (and surprising) like Anchovies & Olives’ deviled eggs were. -This was the first time I enjoyed the fried oysters on their own merit and not on culinary expectation. It may not make sense to anyone else, but the dish may have been my oyster gateway drug that gets me ordering such entrees more regularly. They reminded me of the delicious fried food from you-know-where. -Since Mr. T was going for the burger & I knew he’d let me have some so I could pass Burger Judgment, I went for the mini lobster rolls as my main. The rolls en toto were underwhelming. But the bread was laced with crack — oh, I mean butter. Enough butter. At $18, I won’t be ordering this dish again but my curiosity was met. It was smaller than the order of ham biscuits, which were $9.50. -Service was great in the beginning but lagged towards the end. We had to track down our bill, which is always a tidge disappointing when you know your party of 6 already gets the auto-18% gratuity. I bet they do very, very well on smaller parties so don’t let this sway you. Will report back when we give them another spin. -Speaking of returning, I’ll be getting both the burger & the ham biscuits again. These were highlights. The burger had white cheddar, pickled onion, and louie sauce. Everyone enjoyed theirs–well worth ordering. Cooked perfectly & the bun was a worthy match. -The ham biscuits had white cheddar, kurobuta ham, and calvados apple butter. Three in one order were too few for our group of 6, but I’d bet these would make me happy for a main. Finally, this restaurant is in our neighborhood. Hooray!